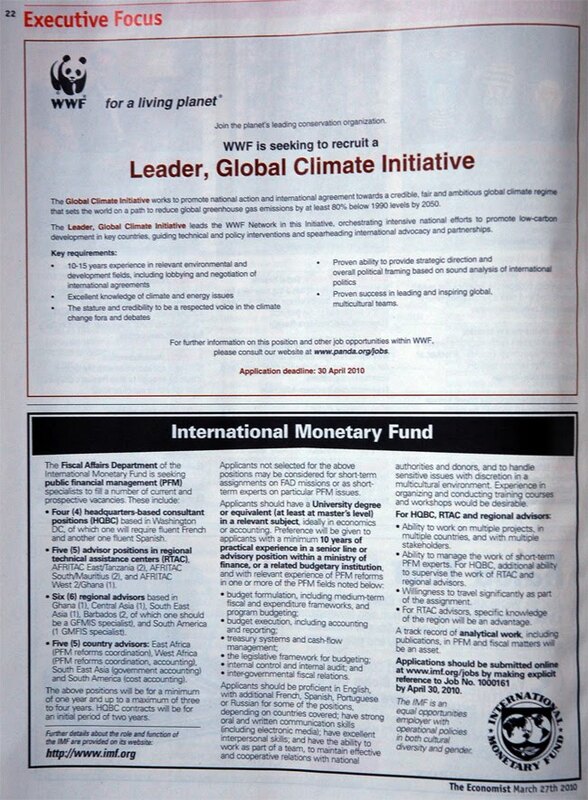 Directly below is an ad purchased by the International Monetary Fund. This organization is using the same amount of ad space to recruit – count ’em – 20 individuals (each with a minimum of 10 years of experience). As public financial management specialists, these people will advise national governments in various parts of the world. To the right, over on the next page, two more ads appear. One has been placed by the UK’s MI6 – which is looking for intelligence officers, language specialists, administrators, and technology professionals. The other has been purchased by the Competition Commission – “one of Europe’s foremost competition agencies” – and advertises for two positions. What does all this mean? 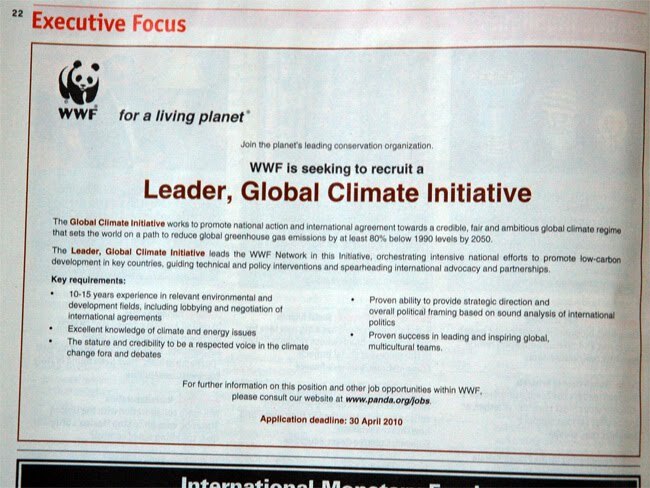 First, in five pages of ads devoted to executive recruitment, the WWF ad represents the largest spend to fill a single position. Second, the company it keeps tells us a great deal about how the WWF both behaves and regards intself. 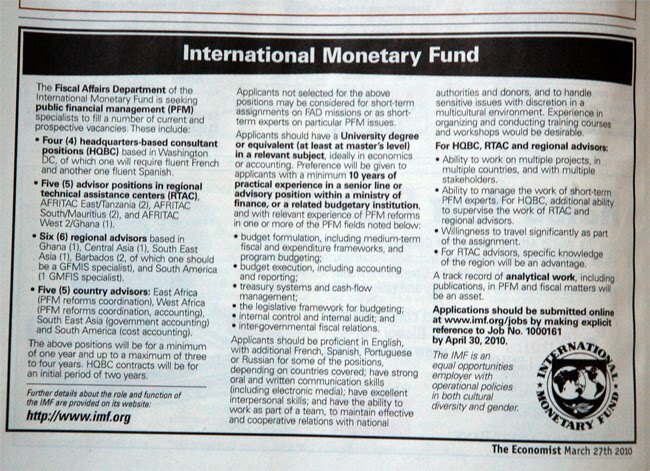 The IMF, MI6, the United Nations, a hedge fund. These are large, influential, high-profile heavy hitters. There are no shoestring operations here – no small, volunteer-run, community groups battling the establishment like David against Goliath. When it comes time to fill a senior position, the WWF doesn’t place ads on Craigslist or in the back pages of left-leaning Rolling Stone. It goes where the big boys hang out. It behaves, in other words, exactly like any other large corporation. This entry was posted on March 31, 2010 by Donna Laframboise in money & funding, NGOs, World Wildlife Fund and tagged Economist magazine, United Nations, World Wildlife Fund, WWF.